Spencer’s drive to learn sheds light on his lifetime of fascinating careers and artistic pursuits. He is an accomplished musician, having learned to play at least five instruments and performing as a vocalist with groups such as the Jimmy Smith Trio, Smokey Robinson & The Miracles, and War, to name a few. He served in the US Marine Corps, was an Honor Guard to President Nixon, a firefighter, medic, and an arson investigator, worked for several Annapolis mayoral administrations—the list goes on. With a master’s degree from Sojourner-Douglass College, he is an adjunct professor at Anne Arundel Community College and president of Nomads of Annapolis, Inc., an organization dedicated to sending minority youths to historically black colleges. Also a poet and writer, he has contributed articles to the Anne Arundel County Historical Society. 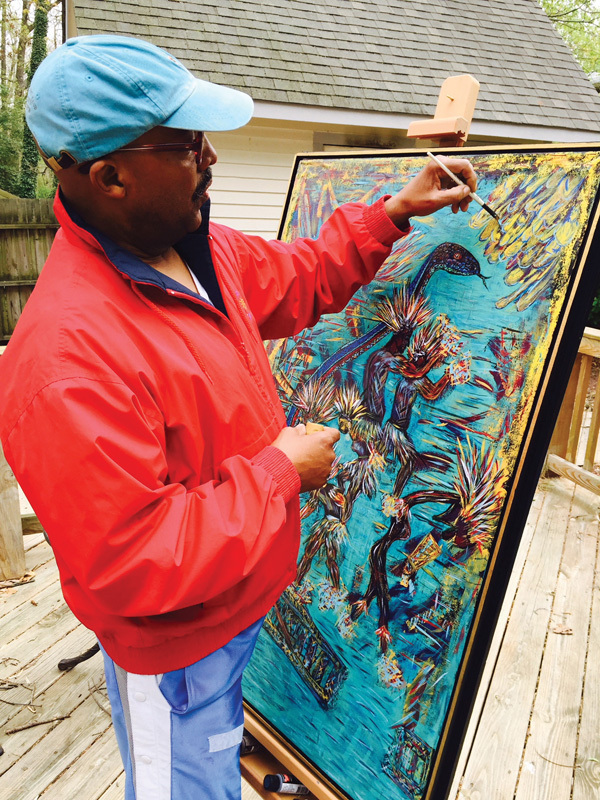 Born and raised in Marley, a neighborhood in Glen Burnie, Spencer’s passion for art was sparked by a beloved high school art teacher, Louis Schatt. He warmly recalls Schatt’s special way of pushing him out of his artistic comfort zone. “If he didn’t agree with something [on a student’s canvas], he’d just say, ‘Uhhh . . .’ and walk away.” Spencer received the “Uhhh . . .” treatment once, while working on a painting with raspberry hues. “I was frustrated, so I took spray paint and just did a light coat of black over it. [Mr. Schatt] came back over and said, ‘Yes!’” he laughs. Spencer was surprised and delighted when his former teacher showed up for the opening of his 2016 exhibit at 49 West Coffeehouse, Winebar & Gallery, and the two picked up as if decades had not passed. Spencer’s home displays works by locally and internationally known artists. Several pieces by Alonzo Davis, including a painted bamboo wall sculpture, adorn the living room. A print by prominent Washington Color School painter Sam Gilliam hangs near the stairwell. 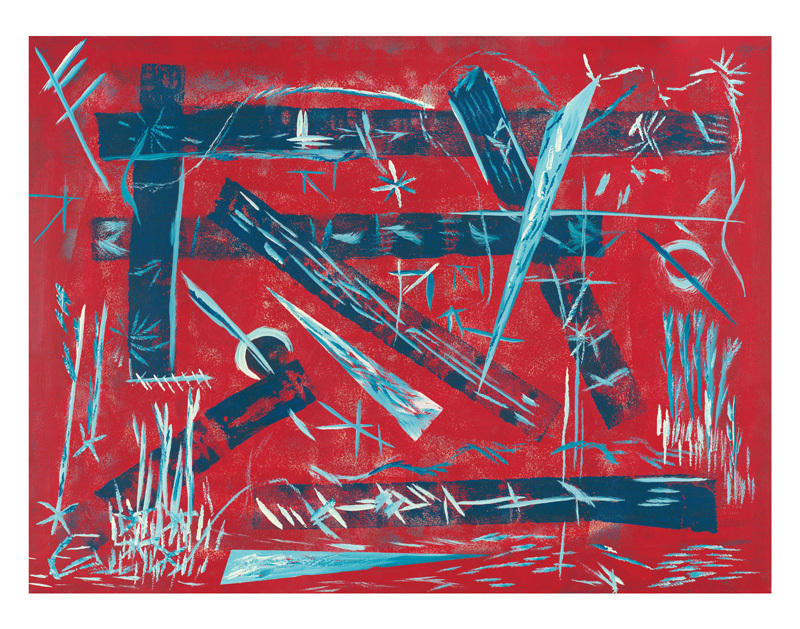 Spencer’s admiration for these artists comes through in his bold use of color and shape. He also extolls the creations of Salvador Dali for exemplifying ultimate creative freedom. In 2003, Spencer and his wife, Vivian Gist Spencer, visited the Dali Theatre-Museum in Figueres, Spain. There, the sculpture garden, the collection of works by artists that inspired Dali, and the sheer range of Dali’s own work reinforced Spencer’s quest for unfettered expression in his own art. “[Dali] didn’t limit himself, and he understood that if it took just one dot to make a message, that’s what he did,” says Spencer. An even more profound influence on Spencer’s worldview and work is his remarkable family legacy. His great-great-grandfather, Captain James William Spencer, was born a free African American in Maryland around the year 1817. In an unprecedented undertaking for his times, he started purchasing land. One of those parcels, located in the area now known as Marley, would become Freetown, one of the largest communities of free blacks outside of Annapolis. Captain Spencer, who had to carry a certificate proving his freedom at all times at the risk of being sent into slavery, found a way to pursue freedom within a slavery-driven society, as owning land created personal and community agency. He went on to fight for the Union in the Civil War. 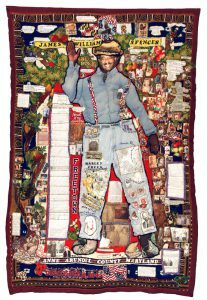 “James William Spencer Documentary Quilt” is an important work of Spencer’s that honors his family legacy. 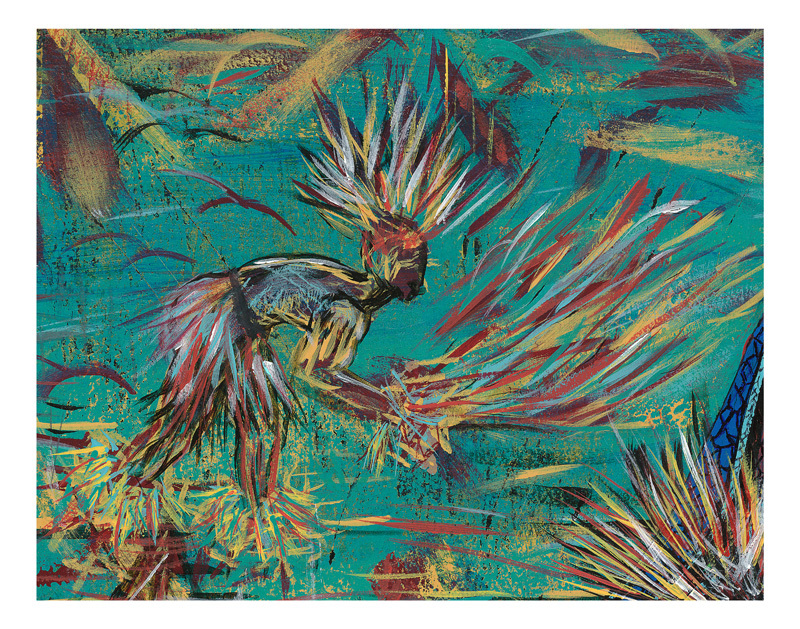 It uses images to tell the story of Freetown and the descendants of Captain Spencer, up to the present day. 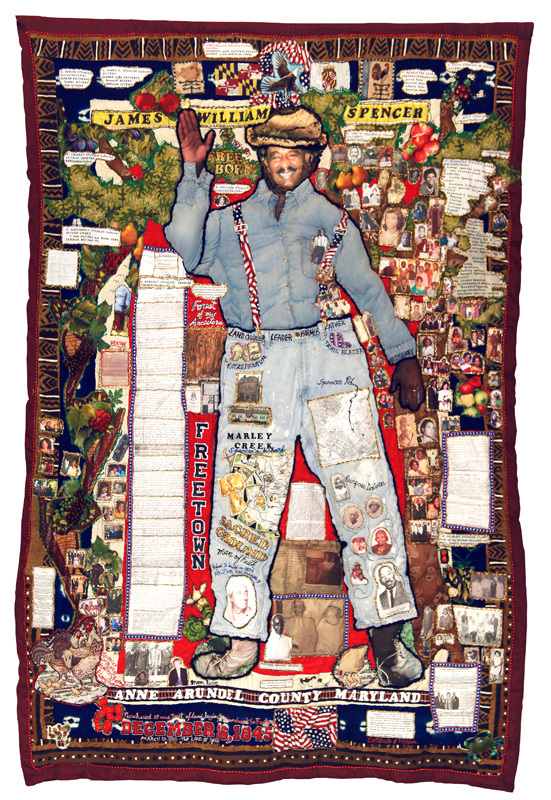 With the help of Dr. Joan M. E. Gaither, an artist, educator, and master quilter who specializes in storytelling quilts, Spencer worked on the piece with a team that included his wife, Vivian, several other family members, and Alderwoman Sheila Finlayson for three to four months. Recalling the immersive experience he says, “You sit down for one hour to work on the quilt, you look up, and believe it or not, three hours have gone by!” The quilt has been part of exhibits at the Benson-Hammond house in Linthicum, Annapolis City Hall, and the Whiley H. Bates Legacy Center, and was recently at Anne Arundel Community College as part of Spencer’s solo exhibit, TRYBE-ALL CELEBRATION, in recognition of Black History Month. For Spencer, the art-making process is flexible, forever evolving, and takes him in new directions. Nothing is set in stone, and the best-laid plans might be cheerfully forgotten as inspiration takes over. For him, art means surrendering to a power greater than himself. “Can you understand being a channel,” he asks, “and allowing things to flow?” This approach fuels the constant evolution of his work. 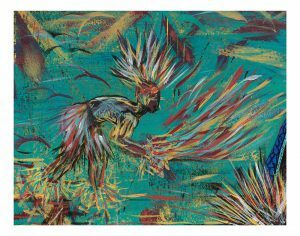 He may print paintings or sections of paintings onto archival paper or canvas so he can add paint back into the new compositions. A sketch done on a paper towel might end up printed onto canvas so that it can be further developed. He has a nomadic approach to his creative space—his easel might start in his living room and then travel to the sunroom near the bar or out to the back deck, depending on the light. Look, listen, and learn more at www.enrapture51.com. Error: Error validating access token: Session has expired on Saturday, 09-Mar-19 15:57:50 PST. The current time is Tuesday, 23-Apr-19 01:09:57 PDT.